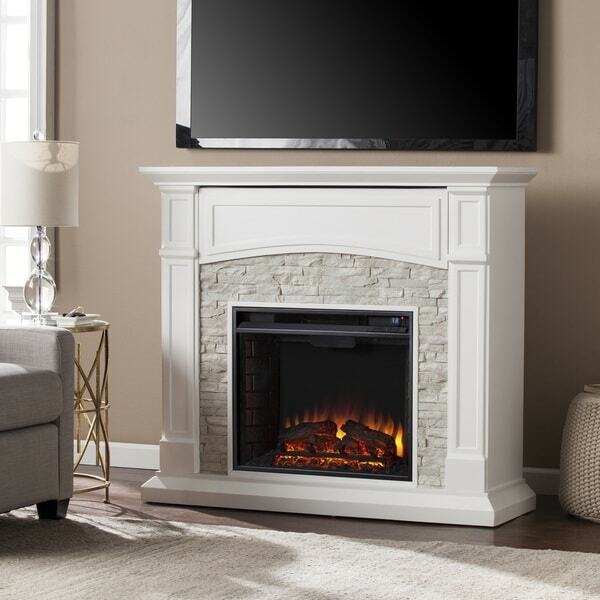 Add rustic charm to your living room decor with this customizable fireplace from Copper Grove. 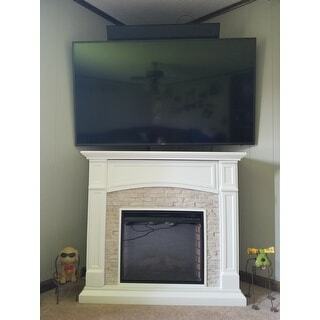 The traditional white frame is complemented with faux-stone detailing and a hidden inner shelf for storage. 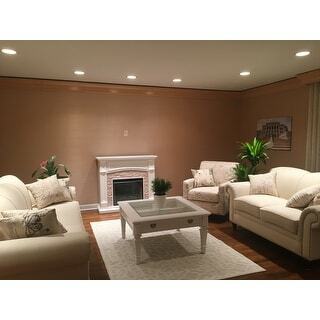 Personalize the thermostat, flames, and logs from the comfort of your sofa with the included remote control. Dimensions 14.5 In. X 45.75 In. X 40.75 In. 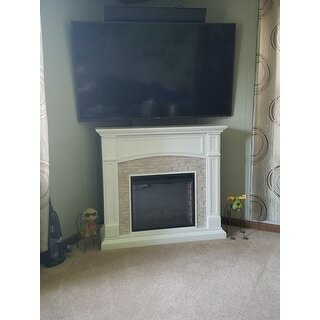 I have been eyeing up this fireplace for sometime now, but also looking around at others as well. I am extremely happy I finally decided on this one. 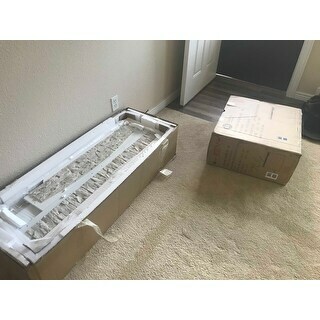 It was delivered 5 days before the approx delivery date (I was soo happy about), and it did come in two packages as stated. I always get nervous ordering heavier items that get shipped because of the possibility of getting damaged, but this item is very well packed. After opening it all and making sure all the pieces were there, we only noticed one piece that was slightly damaged but after figuring out what piece it was (which was the back side of the very bottom piece) We decided it wasn't going to effect the sturdyness or look of the fireplace so we decided to just keep it. It took about 2 hours to put together and the the finish on it is beautiful. We have this in our living room and couldn't he happier. 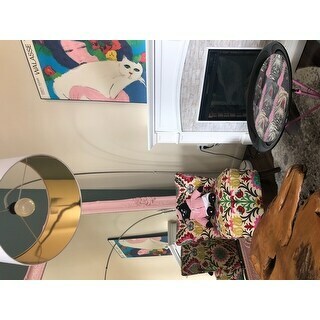 The colors of the stone on the front of the fireplace was slightly more tan than I originally thought it would be but it is still a fabulous piece. 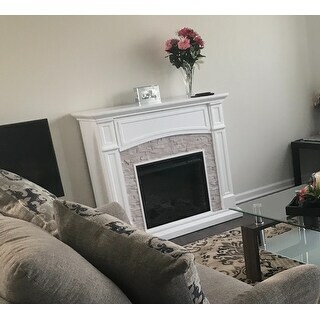 In The picture i attached has a 65 inch tv mounted on the wall above it to kind of give an idea of the size if the fireplace. 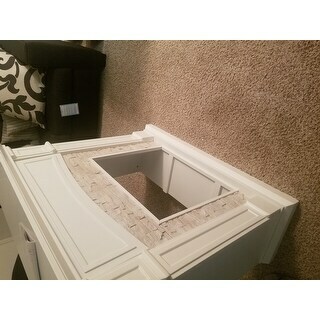 Love the faux stone look on this fireplace and the hidden media storage is the best! The flame and log lights can be made brighter or dimmer and you can have the flame on with or without heat which is great! Love this fireplace!! 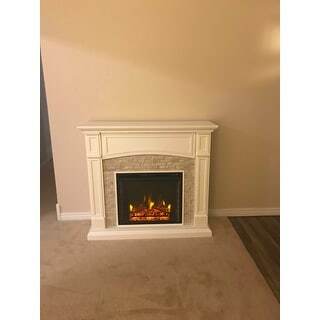 I have always wanted a fireplace but have a very small home. This is perfect! Assembly was easy even for a 64 year old woman who did it by herself. Hardest part was bringing the heavy boxes into the house. The firebox is really nice and the flames and logs look very realistic. Heater is a nice addition but I don't really need that. I love the TV equipment storage in the front -- easy access and nice clean look. 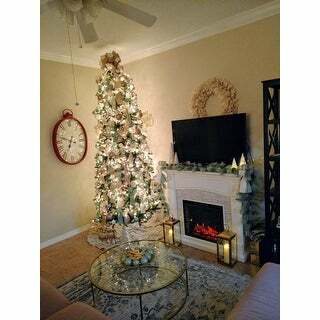 This is going to be beautiful for Christmas this year! 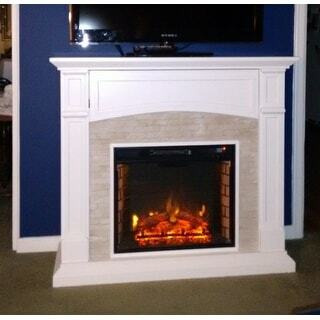 this oliver and james white faux stone electric media fire place took a while to put together but came out beautiful. it looks great and the white faux brick really gives the piece character. looks beautiful and easy to assemble! The only thing imperfect is that the odor is big when first getting out of box and in the first few days. I never write reviews, but........WOW! It came quickly, was well packaged (not a misaligned hole or a chip anywhere), and 2 friends put it together in less than 2 hours. I could not be any happier. The logs and flame are better than I had imagined and the clicker works perfectly. The faux stone on the front looks great --- and I am a stickler for "faux" anything. If you are reading this and the sale is still on, GRAB IT! 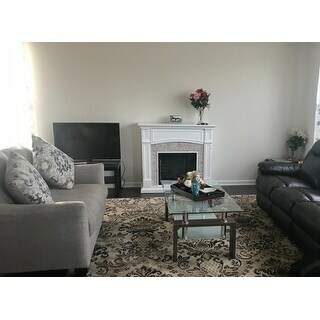 PS: I have no connections with anyone associated with this fireplace. I am just a happy consumer. 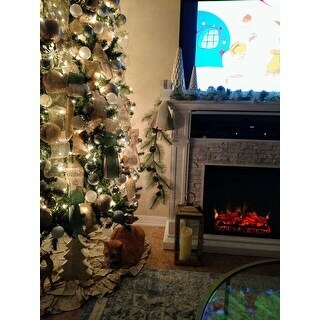 Makes my living room cozy and complete !!! This fireplace is beautiful. It came up in 2 boxes. I was worried , how difficult it would be to assemble it. But it comes up with step by step instructions and all the parts are excellently numbered to fix right at first. This has definitely made my living room look cozy and complete. Its a must have. I have just assembled it and cant wait to get few picture frames and candles to accessorize it with. I am glad I purchased this but now very happy with it. Beautiful and elegant! Not hard to put together if you don't like to build stuff it will be tedious but not difficult. Flames and logs look amazing!!! 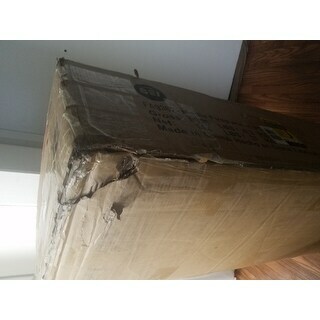 Box came a bit damaged but the inside product was perfeclty fine which was my biggest fear of ordering something like this online. Happy overall. Love this fireplace! The media storage is so nice to have all of the electronics tucked away. The faux stone compliments our decor and doesn't look chintzy. The unit is fairly quiet, and the flames add a nice ambience to our space. Would definitely recommend! We love this fireplace! I looked for a long time for one that was good quality and worth the price and I am so happy I went with this one! It was very easy to put together. It keeps the living room and kitchen area very warm when you turn it up. To me, the flame was not as realistic as others have stated but the logs do look real and it’s very peaceful to have on while you’re relaxing. This came in two boxes that were very dinged up. Once open, there was no damage or scratches on the unit. I was able to put together by myself while my boyfriend was at work. The instructions walk you through step by step and each part is labeled perfectly. One big tip to remember is make sure that the rock panels on each side are perfectly lined up when you are screwing them in since I did not see any screw guides on that step. Mine were slightly crooked and would not fit properly until I did one side over again. Overall, I have not complaints and am so happy I bought this product. Still getting used to it. I love it because it’s not pretending to be a real fire place. It’s kinda campy and fun. The heat blows out from the top. I LOVE IT!!! Everything arrived in perfect condition. I was able to assemble in about an hour and a half on my own. Instructions were great. Just take your time. 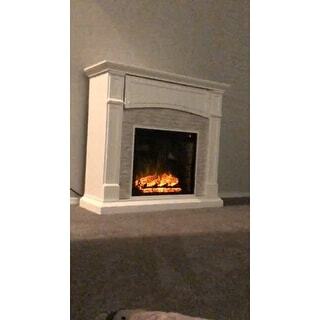 Perfect little fireplace for my new home! Cant wait to decorate it! Looks great against my white wall. It is a decent size, a lot of space to decorate the top. The hidden compartment comes in very handy for my cable box and I can even leave it closed to hide the box and the control still works to turn on/change channels through the closed compartment. My only dislike is the way the compartment closes, it tends to stick out a little like it doesn’t close all the way but it’s covered up with my garland decoration. Overall I am very happy with this purchase! 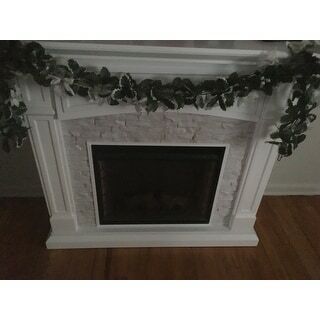 This fireplace is very pretty but very poorly made. The bottom piece didn't match up when we placed the top part on, totally throws off the whole thing. The holes don't line up at all.highly disappointed because I really want to love this piece. This fireplace is BEAUTIFUL! 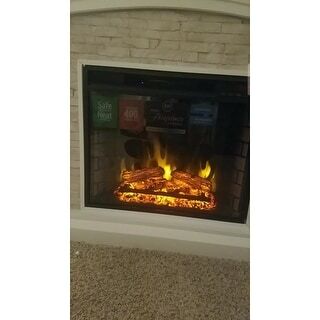 Makes the room feel cozy and relaxing.. the only issue i had was there is damage to the item during shipping. and the bottom base was not put together correctly and there are staples popping out and huge cracks. not really noticeable when fully put together. I’m very happy with how it came out and it works beautifully. I went to a friends house and she had a fireplace s I didn’t want the expense of adding one so this was the next best option. Beautiful! We love it. The instructions were easy to follow and the piece came together perfectly. The fireplace heats out our living room very well and the lighting options are fun to play with. The only issue we have had is the remote’s on/off button is hard to press. "What are the dimensions of the media shelf?" Shelf: 5.25 inches high x 40.5 inches wide x 9.25 inches deep. "Does this come all out together or in pieces u have to assemble ?" The item comes in pieces to be assembled. "Is this a corner fireplace? " "Can I use this fireplace on a screened in porch"
I don't see why you can't, as long as there is an electrical outlet. "What color is the brick pattern inside? How much does it stand out?" "Does this come with a blower?"